(Nanowerk News) In a development that could lead to a deeper understanding of cancer and better early-stage treatment of the disease, University of Michigan researchers have devised a reliable way to grow a certain type of cancer cells from patients outside the body for study. The new technique is more than three times as effective as previous methods ("Expansion of CTCs from early stage lung cancer patients using a microfluidic co-culture model"). 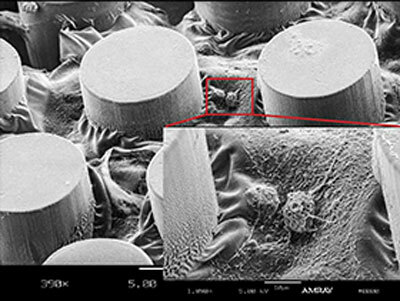 Electron microscopy shows cultured CTC cells (circled in red) growing on the chip device used in the study.